This is one of my favorite DIY techniques to teach my clients. I did it by myself for several years before realizing how much my clients enjoy participating in this step of the room installation process. Now I teach it to everyone who wants to learn! 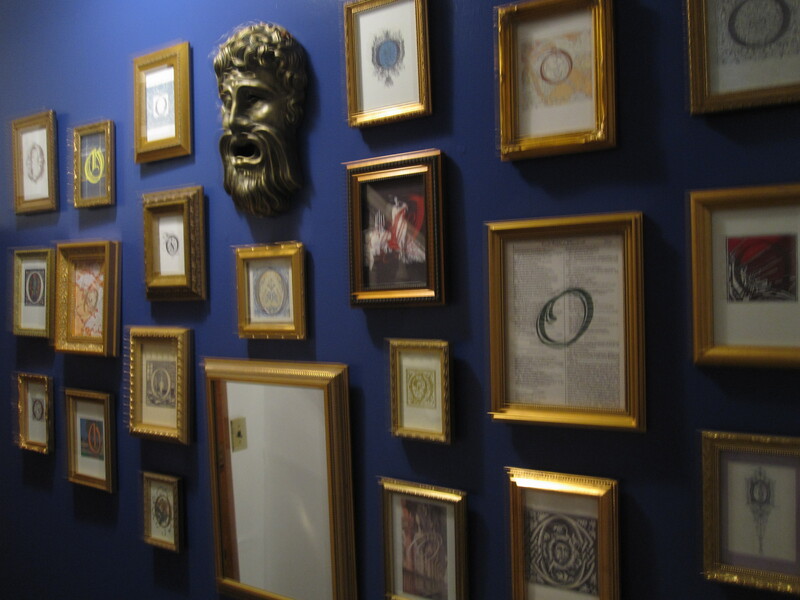 As much as they are popular, gallery walls can also be quite intimidating. So much relies on getting the arrangement right and then hanging it all to match what you’ve imagined in your mind. Beginning today, those worries are over! We are going to hang a gallery wall of art without making one single mistake. Not one nail hung in the wrong place and not one picture hung just a little too high/low/close to the next one. 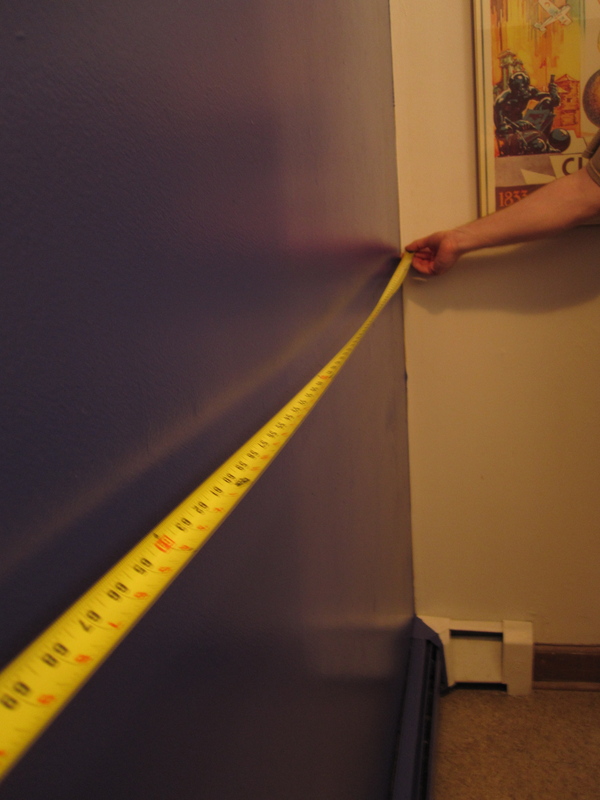 Measure your entire wall and decide on the total area that your art gallery will take up on that wall. We’ll call that decided-upon-area the “gallery box”. 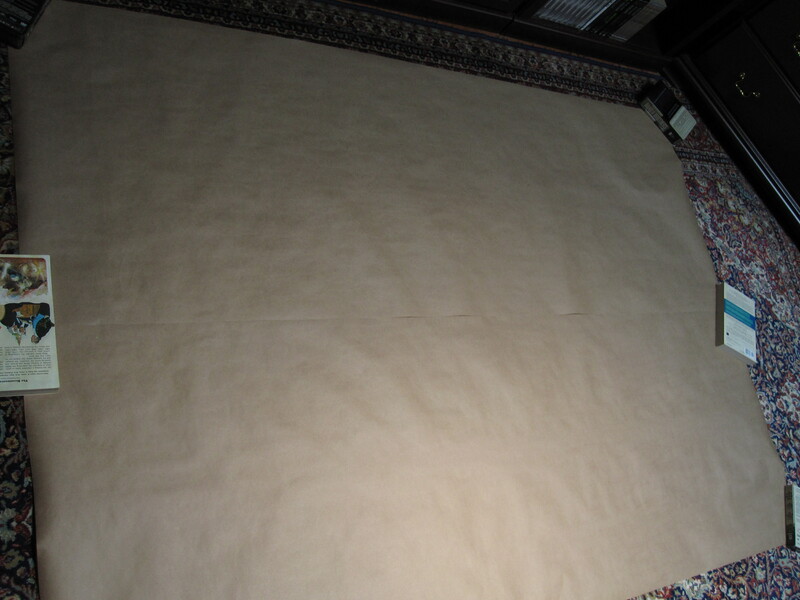 On clean and open floor space, roll out your paper roll to mimic the total area measurement of the gallery box. If you are using wrapping paper be sure to have the white side of the paper facing up. 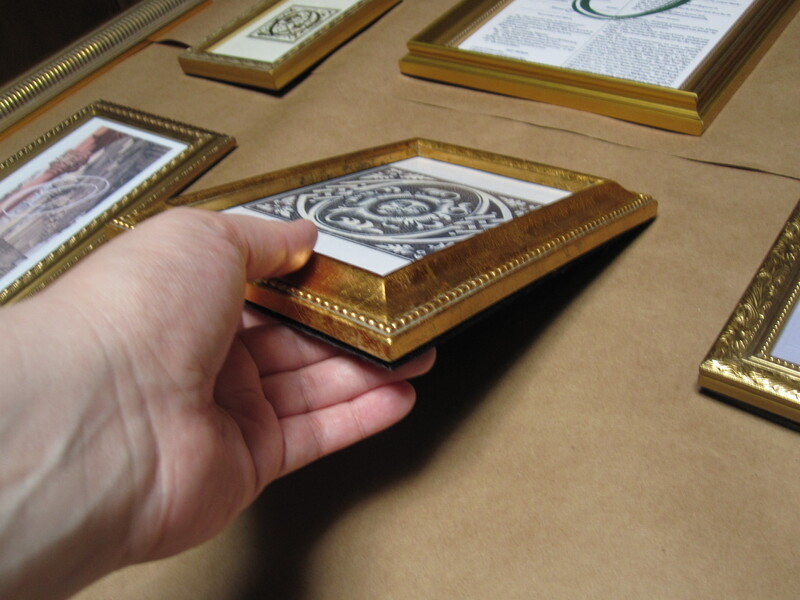 If your gallery box is taller than your paper roll, use the painter’s tape to secure two rows of paper together on the back sides of the paper. Weigh down the corners of your paper with books, as needed. 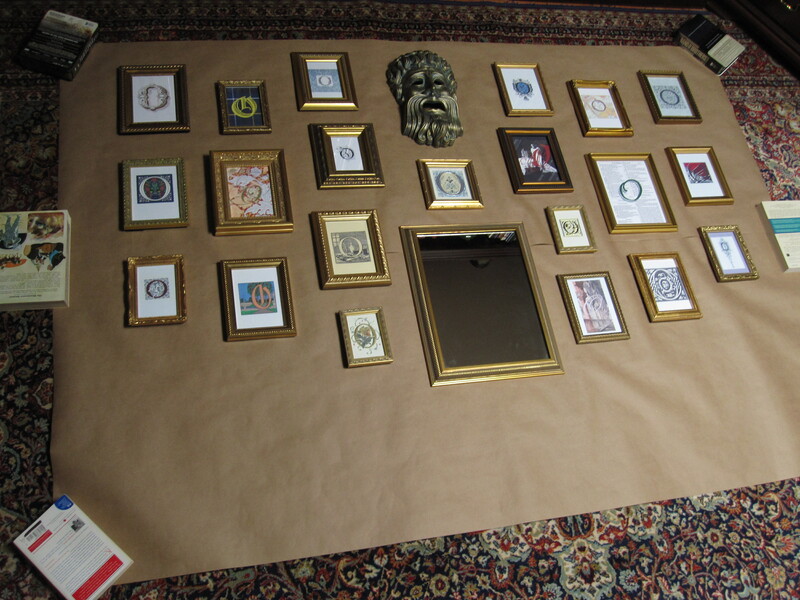 Now lay out your art on the floor within the gallery box. Move the art around as you play with the layout. Look at the gallery box from different angles. If you have a very large gallery box, like mine, try viewing it from atop a tall step stool or short household ladder to gain perspective. Keep moving your art around until you are satisfied with all of the placements. 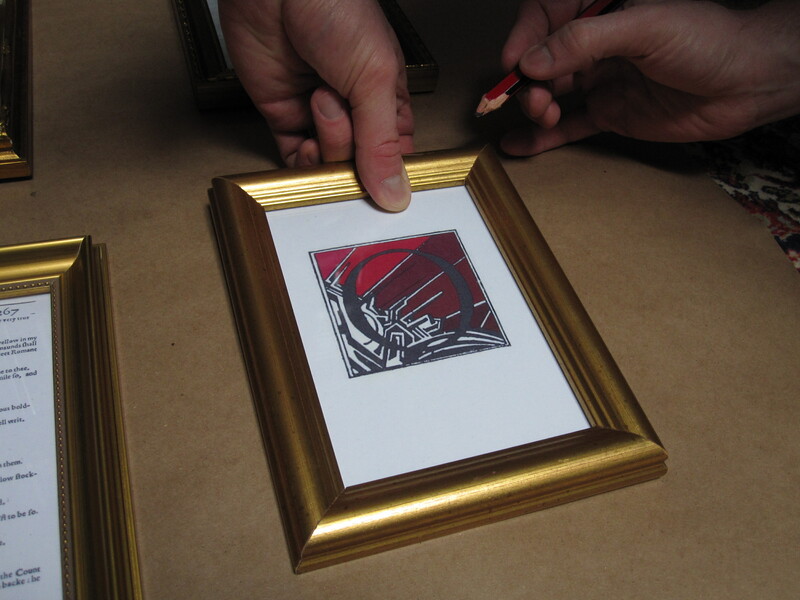 When you are happy with your art layout, take a picture of the gallery box as a whole with the art in place. Get back up that ladder if you need to, you’ll thank yourself later! 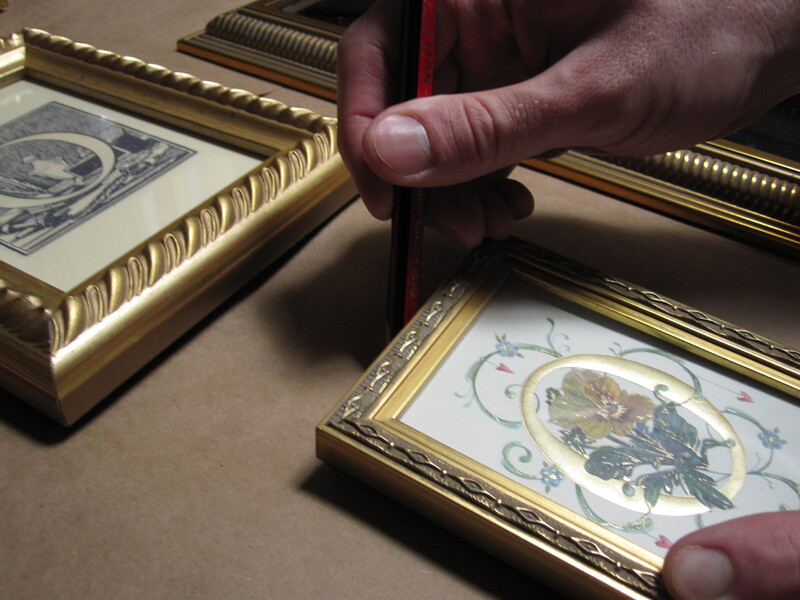 Next, take your pencil and mark the top of each frame in its proper position on the gallery box paper. Here’s the hardest part of this whole project: you have to mark exactly where each frame’s hook is on the gallery box paper. 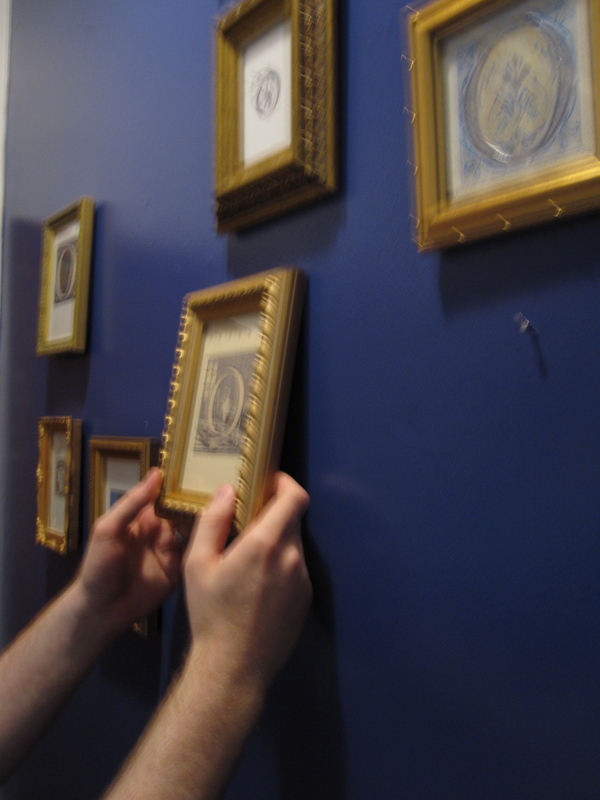 You have to get this part very accurate or it will undo your careful spacing and your gallery will migrate oddly on the actual wall. If you missed it earlier, there are two easy, accurate ways to measure this and I’ve put them both within the steps of this tutorial post. 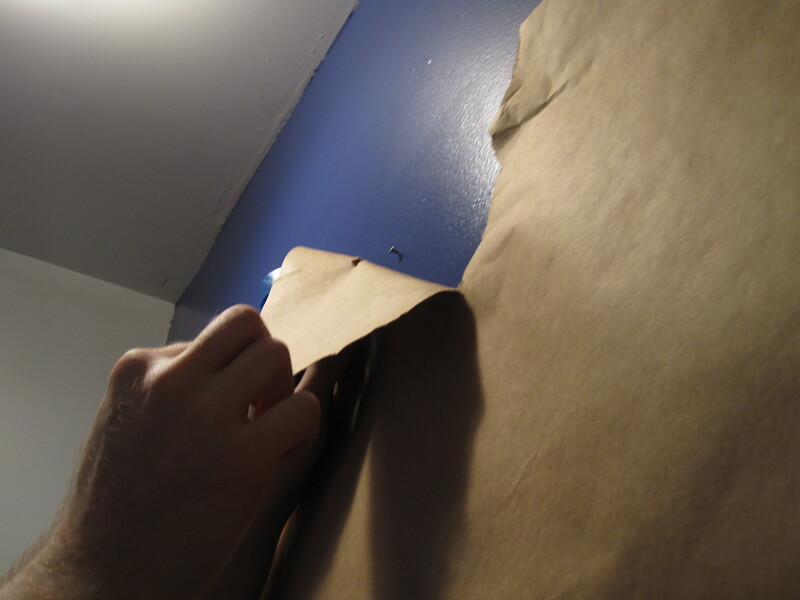 Using your painter’s tape, you are now going to attach your gallery box to the wall on which all of the art will hang. 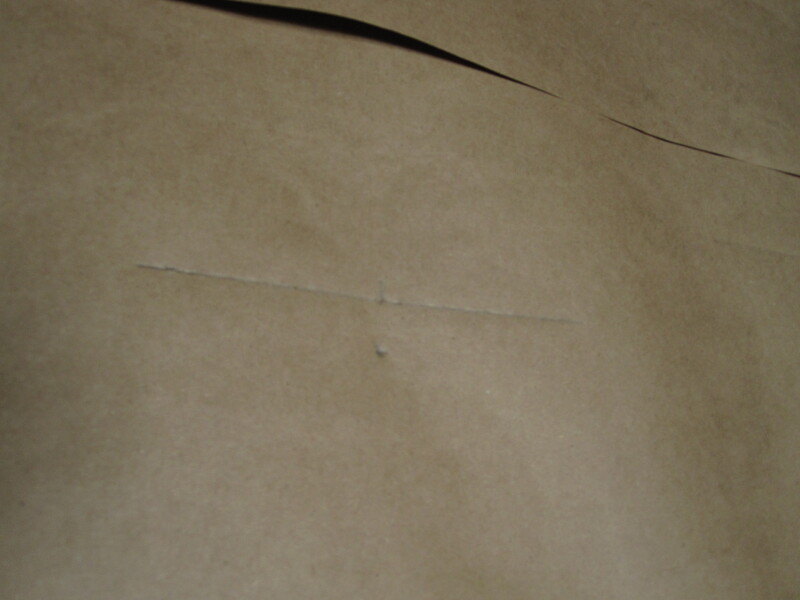 Use extra tape to make sure that the paper is secure. This is great time to make sure that you like the height at which your gallery will be hung. It’s quite common for people to discover they want their gallery to begin a little higher up on their wall then they had originally considered. 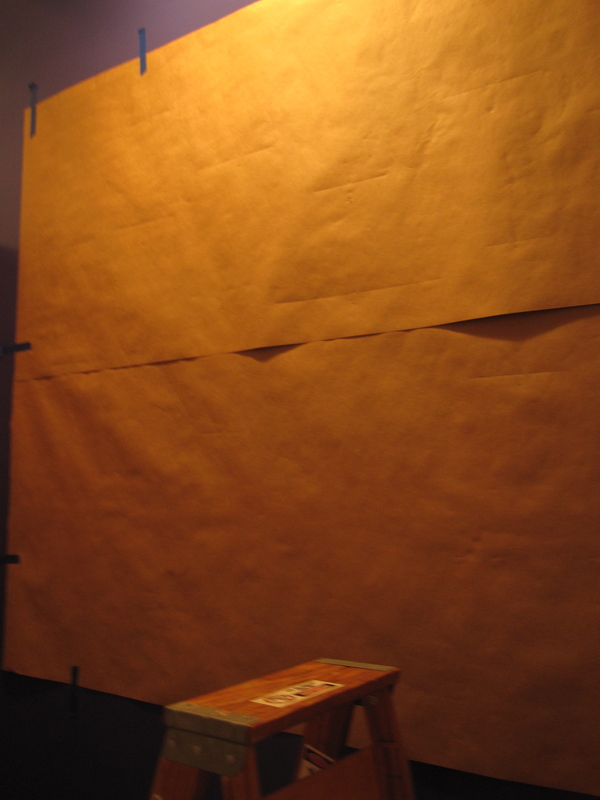 With this method, you don’t have to re-hang all that art, just adjust your paper! With the gallery box now secured on the wall, let’s get some nails up. Hammer the nails right through the paper. (To use your hammer properly, check out this tutorial right here.) 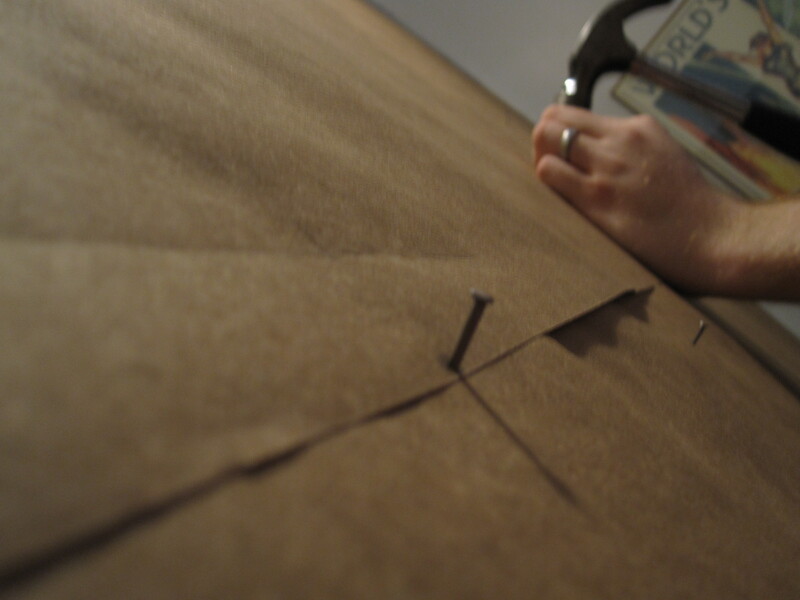 All of your nail placements are perfectly marked, so all you have to do is work down the wall until you are done. Nail work done? Take the tape off of your gallery box paper and then GENTLY, so as not to pull out any smaller nails, tear away the paper from the nails. Use your photo (the one that you may have taken from the top of the ladder) to hang up all of your art on their respective nails. Now that you understand this gallery art hanging technique, you can use it for small or large groupings of any kind of art in your home. It takes away any guesswork and nail hole patching by letting you see your art collection as a whole before it is on the wall. 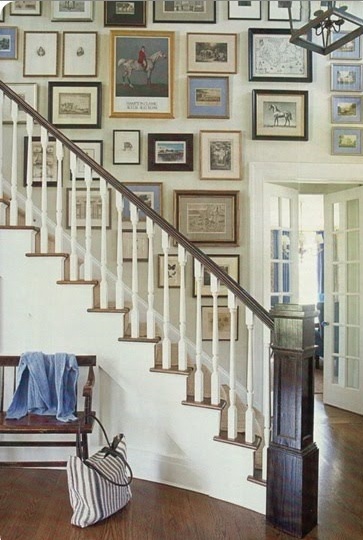 Imagine how much easier this can make hanging a gallery of pictures up in a tricky place, like up a staircase wall! Where can you use this technique in your home? What have you been dying to get up on your walls? Be sure to leave a comment! You may inspire others for their projects! Posted on June 13, 2011, in Decor, DIY. Bookmark the permalink. 2 Comments. You are a genius! This has always fascinated and intimidated me. I’ve always wanted to do this and have tried a couple of times, but it always took me forever. Thank you so much! 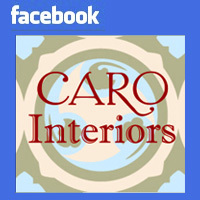 And Mr. CARO, too!